Identity/Class: Alien (unnamed race). Acquired cosmic powers and an unique role by unknown means. ultimately all beings opposed to universal destruction. 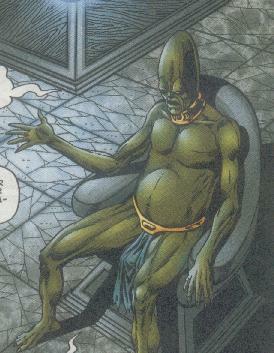 Enemies: Moondragon (while mind-controlled by X), the Nihilist Sect and its troops, The Thanosi (Armour, Mystic, Omega, Warrior and X), possibly other nihilists (see Comments). Base of Operations: a palace inside a sphere of Reality Anchoring - apparently one of several attuned to different realities. His version is attuned to Earth-616's dimension, and is perhaps accessible only by mystical means. Powers/Abilities: just like all of his predecessors (and his successor Atleza Langunn), Atlez is gifted with specific yet incredibly mighty cosmic powers that allow him to "anchor" a whole Universe out of the void of Final Oblivion. 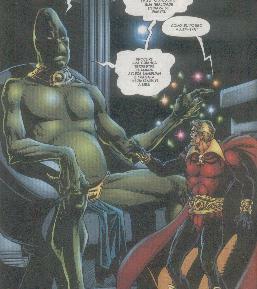 He has demonstrated additional powers (most noticeably causing or at least directing the fall of a meteorite and the transmission of vital information to Adam Warlock's Soul Gem) that may be accessible only under great cost and/or in specific circumstances, probably linked to the search for a successor to his task. For some reason he was capable of direct communication with Adam Warlock (and he alone) even when he was in Earth-616's plane, far away from his palace. Atlez may or may not have been a typical specimen of his race, and may or may not have been mutated in some way by his role and/or the place where he exercised it. An obvious guess would be that his life span and his mindset were both changed to better allow him to anchor reality, but this is unconfirmed. History: (Infinity Abyss#5, flashback) - Atlez was the most recent of several Reality Anchors attuned to Earth-616's plane of existence (and apparently recruited from its inhabitants). He had been active since the dawn of the Roman Empire and his natural life was about to end. (Avengers Forever#1-12 (bts), Infinity Abyss#5 (flashback)) - The Destiny Wars conflict (involving the Time-Keepers, Kang, Immortus, Rick Jones and the Avengers of various timelines) created a serious yet undetectable anomaly in the flow of time. As a result, Atlez's substitute in his role as Anchor of Reality was born only two years before his time of death. (Infinity Abyss#2,#4 and#5, flashback) - Having sensed the complications involved in his succession, Atlez summoned Adam Warlock to his presence and explained his role as Anchor of Earth-616's Reality. (Infinity Abyss#5, flashback) - Warlock agreed to help Atlez in recruiting his successor (the human child Atleza Langunn). Atlez then gave Warlock and his Soul Gem the information they would need to release to Atleza, but the strain proved too much for Warlock, who lost his sanity. (Infinity Abyss#1 and#5, flashback, bts) - Unable to restore Warlock's sanity directly, Atlez chose to release him into the surface of the planet Degaitor, were he spent about two years recovering from his trauma inside a self-made cocoon. Realizing that further action would be needed to heal Warlock's mind and allow him to find Atleza Langunn in due time, Atlez decided to plant into the Thanosi the suggestion that Warlock was the key to establish Final Oblivion; he also directed a meteorite to free Armour from his containment. He succeeded, but involuntarily also freed Mystic, Omega, Warrior and X in the process. (Infinity Abyss#1 - bts) - The five freed Thanosi began to scheme to find Adam Warlock (hoping to learn the secret of Final Oblivion from him). X eventually disguised himself as the original Thanos by means of a mental projection and recruited Pip the Troll to rescue Warlock. (Infinity Abyss#1) - Pip found and managed to rescue Warlock (still in cocoon form) from the alien insane asylum he had spent so many months in. He brought the cocoon to the Thanosi's ship, where it was examined by X (disguised as Thanos) and Moondragon. (Infinity Abyss#2) - Moondragon and X (still disguised) succeeded in awakening Warlock (who had changed physically inside the cocoon - see Comments) and made him realize that he had lost memories of an important mission given to him by someone named "Atlez". Mystical energy trails began to form, trespassing various dimensions while linking Atlez to his future successor, Atleza Langunn (now a two years old female human child). Those trails drew the attention of Captain Marvel and Doctor Strange, who decided to travel through them, and of Armour, Mystic and Warrior, who reacted by sending a squad of nihilistic soldiers to Earth to investigate. Spider-Man was also drawn to the energy trails, which ended at a country house - that of the Langunn family. (Infinity Abyss#3, Sep 2002) - Pip teleported himself and Warlock to Monster Island (their former Infinity Watch headquarters) hoping to help in recovering his lost memories. Warlock remembered contacting Eternity two years before and convinced Pip to bring them to a manifestation of Eternity. Arriving there they found Eternity half-merged with Infinity and suffering of mild insanity. (Infinity Abyss#4) - Mystic and Warrior realized the significance of the mystical trails that linked Atlez's palace to Earth-616's reality and decided to follow it all the way to the end, correctly hoping to find the Reality Anchor (Atlez) there. The joined Eternity/Infinity entity was convinced by Warlock to open a portal to the dimension where Atlez was - exactly as it had done two years before. Warlock then retraced his own steps, hoping not to be driven mad by the experience this time. (Infinity Abyss#5) - Atlez was finally met by Adam Warlock and reminded him of his mission: finding Atleza Langunn, giving her the information stored in Warlock's Soul Gem and bringing her to his palace outside the boundaries of Eternity and Infinity before he (Atlez) died of old age. Warlock and Atlez were then attacked by Mystic and Warrior. The fight went badly for Warlock until Doctor Strange joined them and defeated Mystic. Unfortunately, Warrior then managed to knock Doctor Strange out. His opposition defeated, Warrior then confronted Atlez, who attempted --to no avail-- to show his attacker that the cause of Final Oblivion was pointless. At that moment Warlock, desperate and out of options, used his Soul Gem to take Warrior's soul - killing Warrior and severely disturbing Warlock's mental balance. (Infinity Abyss#6) - Atlez was taken care of first by Doctor Strange and shortly later by Moondragon while Warlock slowly regained his mental balance and awakened Atleza Langunn to her destiny. Atleza and the assembled heroes had then to fight the last and most powerful surviving Thanosi (Omega) before the two Reality Anchors could finally meet each other. Atlez died just as Atleza, Gamora and Warlock materialized back in the palace, without so much as a last word. COMMENTS: Created by Jim Starlin and Al Milgron. It may sound strange for Adam Warlock to retreat into a cocoon, but that has always been one of his tricks. He initially emerged from one in Fantastic Four#66-67, made himself a new one in Thor#166, and later repeated the trick at least once in both of his first two regular series. For some reason those cocoons often (but not always) change his physical appearance and costume somewhat, as seen in the Infinity Abyss series. The main function of those cocoons is to shield Adam from any external sensations and allow him to heal his body and (above all) his mind. One may reasonably assume that during the later years of his duty Atlez found himself in conflict with the beings that aimed to bring Final Oblivion into existence (some of which were even successful, albeit temporarily). IMO those would include Annihilus, the Goddess (Warlock's female alter ego who caused the Infinity Crusade), Maelstrom, Oblivion itself (and its agent Deathurge), possibly the Stranger (since he used the Null-Life Bomb in Silver Surfer I#5 and Champions#12-13), Thanos himself and any and all people who ever even thought about using the Universal Nullifier (including Galactus, Quasar, Reed Richards and Uatu the Watcher). Profile by Luis Dantas, the Daevanator.